Skateboard Prevention Devices for Stone sell for between $17 and $21. 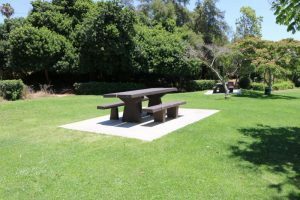 On July 12, Kelly saw a peculiar bench and table located at the Montclair Park (at the end of Quince Street in North Park). The cement picnic table and benches rest in the middle of the grass by the park entrance. 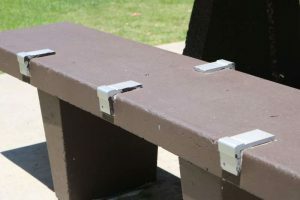 One of the eight-foot-benches had four metal skate deterrents affixed on its edges; the opposite bench had none. Kelly said that shortly after he started skating, the city and businesses started adding skate deterrents on handrails, curbs, and park benches and tables. “It’s impossible to jump (with the skateboard) that far, and I’d rather see someone skate [down] this hill,” said one kid passing through the park. The bench has no cement pathway that leads to it and the sidewalk is about 20 feet away. “Oh you mean those skate stops, it’s kinda funny because you cannot really get any speed to do anything and you can’t ollie [onto the benches nor the table],” said Jake Anzarouth. This day he was landscaping the garden at the house next door to the park bench in question. Anzarouth, 37, has been skating for a while now too, but as a green-friendly transportation alternative. Edemco, a manufacturer and distributor of signs, sells a similar product that both Kelly and Anzarouth are questioning. They call them Skateboard Prevention Devices for Stone and sell them for between $17 and $21 apiece, depending on the quantity ordered.